I was in an LDS bookstore browsing through the greeting cards. 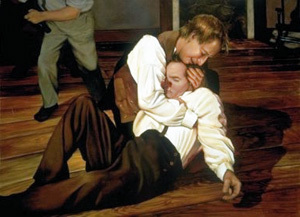 Nestled amidst the birthday, baptism, missionary, and priesthood cards I came across a card (blank-inside) depicting Joseph Smith cradling his brother, Hyrum, who had just been shot. The art on the card is a reproduction of a painting by LDS artist Liz Lemon Swindle called “Oh, my dear brother Hyrum!” The setting is Carthage Jail. As I contemplated the greeting cards on display, I tried to imagine an occasion for which the card bearing the bloody picture of Hyrum’s death would be appropriate. Or desirable. Would a Mormon send this card, then, to a new convert, welcoming him into the Church? Would it be sent as a sympathy card to someone who has lost a loved one? Would a parent send it as an encouragement card to a missionary son or daughter? Would a Latter-day Saint send it to a doubting Mormon in an effort to strengthen a waning testimony? I honestly can’t come up with any occasion for sending this greeting card that makes sense to me. But I’m not LDS. What am I missing? 17 Responses to Any Occasion Greeting Card? I was in Catholic school in the 1950s (yes I’m that old) and we used to have something called “holy cards”. The cards typically had a picture of Jesus, Mary, Joseph or one of the many saints. We used to give them out for valentines day. I don’t think there was anything like the card displayed here. Just a typical artists concept of the saint. St. Francis, I think, would have animals around him, maybe a bird resting on his index finger. The purpose of the holy cards was to inspire and keep us from handing out typical valentines cards. I’ll tell you all about “pagan babies” sometime if you’re interested. would this be sort of like Christians giving cards that depict the death of Stephen or John the Baptist, maybe? Although we will probably never see a card like that (I hope). Was Hyrum considered a prophet by the LDS? Or maybe this is just considered spiritually uplifting artwork, and you would give this to a kid for their high school graduation. You know what, I can not for the life of me see an appropriate time time to give such a card. Hyrum was a counselor to Joseph. All apostles are set apart as prophet, seer, and revlator. But only the prophet himself is the president and leader of the church on this earth. As to the reason why such a card was made, I don’t know. I personally wouldn’t have made it into a card. I would like to know the name of the “LDS store” this was found in. If it is Deseret Books, then it is owned by the LDS church however it is still run independantly and sells many items produced by members of our church or items that is felt to be useful by members of our church. And yes I do consider Hyrum a martyr. What are the most reliable accounts of the mob storming the jail as far as 1) what exactly happened and 2) why they were so angry, why did they want to kill Joseph? I just thought that would be more interesting to discuss than this weird card. Weird, no doubt! As a Christian these words would only be said of Jesus Christ. This quote and card make sense in light of the comment by my Mormon friend that Smith “shed his blood for her”. To me that is blasphemous. It seems to me the purpose of a card like this would be to deepen the emotional attachments to Mormon founding fathers and the Mormon church, although I still can’t imagine an occasion for the card. Well, what respect do you pay to those early christians that were martyred? Are we not allowed to honor those of our faith that were martyred as well, or do you guys have a monopoly on self sacrifice? Or are you just going to make up this whole imaginary thing about how mormon’s place any man before Christ, which is false? It certainly does look like a form of worship. If our pastor had the congregation sing praises on Sunday morning to Peter, Paul, Martin Luther, or John Piper, there would be howling objections, perhaps even the immediate, forcible, physical removal of the pastor from the pulpit. The Christians I know would feel like ripping their shirts in half out of protestation. We love our God and are jealous that only he be worshiped in this manner. We pray that Mormons would have this kind of spiritual sensitivity to see that such worship is only given unto the Holy of Holies. I would leave church immediately if we were singing praise to anyone other than Jesus, or God the Father! The fact that LDS sing hymns to Joseph Smith IS DISTURBING! What respect do we pay to the early Christians that were martyered? Or even latter day martyers or leaders? One of many stones, built up as a spiritual house, a member of the body of Christ. Certainly we do not place their pictures in our living rooms, nor do we worship, praise, pay homage to, base our faith on, or develop emotional attachments to them. If you just look at the way Joseph Smith died it says a lot more than you know. He didn’t just willingly lay down his life for what he believed to be true. He went out shooting. I read he killed two men in the process. That doesn’t sound like a person who would willingly die for their beliefs. I’ve been taught that a person would gladly give his/her life for something they knew was true or at least for what they believed to be true but, that no one would willingly die for something they knew was false. Stephen was the first martyr in the early Christian church. He didn’t fight back and he didn’t run away. He willingly gave his life for what he knew was right. That was the case when you read about the martyrs who gave their lives to advance true Biblical faith. Also: John 15:13 Greater love hath no man than this, that a man lay down his life for his friends. That is what Jesus gladly did for us Romans 5:8 But God commendeth his love toward us, in that, while we were yet sinners, Christ died for us. In light of scripture…I could understand why Joseph Smith would not want to die. Mikeb – Excellent points here! And where does it teach that one cannot defend his friends or family? Joseph Smith was not the only man in that room. Should hae have gladly sacrificed their lives too? Those men weren’t in a situation where they could diplomatically find an answer to the situation. Blood was sought. And even though Joseph prophesied about he and his brothers butchery he went anyway. If it had been Joseph alone, he would surrendered as peacefully, I am sure more peacefully than anyone here would ever have done. I think it is very fortunate that we live in a day and age where we are not required to become martyrs for our religions. So, until any of you are faced with knowingly going to your own deaths, I don’t find any of your arguments with a leg to stand on. As far as this picture is concerned, it is the work of a private individual. It was being put up for sale for a private individual or company. Why don’t you ask them for their causes for selling it, or are you not really interested in the truth? Jacob said “If it had been Joseph alone, he would surrendered as peacefully” This is something that can’t be known absolutely for sure, but comes from a glorified view / emotional attachment to Smith. I don’t understand the above accusations – the comments given don’t have “a leg to stand on”? We “aren’t really interested in the truth”? The reason for the statement is you take something from a private individual and use it for the basis of what our church at large does. I am saying find out why that person had made such a card instead. I already gave my opinion on it. I wouldn’t have sold such a thing because I don’t see any reason to sell it as some sort of card for any occasion. It isn’t that just one Mormon individual idealizes Smith, but rather time and time again he is glorified by Mormons. Though we agree that neither of us sees any reason to give such a card, I see it as a reflection of the emotional attachments to Mormon founding fathers and the Mormon church. Well jer, that is your opinion. If I as one member have given you my opinion from a member’s standpoint, what’s to say that others may not have the same idea. Joseph Smith was a great man who accomplished a great deed for man (whether you agree to it or not). He was still a flawed human being. He made mistakes, obviously. But when anyone shows any sort of reverence toward the man and what he did you guys go all up in arms about how we worship him. We don’t. We honor him. Much the same as if we honor a past president or a great hero who did something spectacular for mankind. The fact is his life marks so much of the beginning of our church, as, except for the first 14 years of life, nearly everything he did coincided for the build up of our church.